Saturday September 6th 1890 We worked all the forenoon to do our baking churning &c and after an early dinner drove to the valley. We found Grand Mother no better. It was nearly six oclock when we left there and with stopping a couple of times to talk with those we met it was lamplight when we got home. Will had a good supper ready and we enjoyed it. There was a hot wind today. Sunday September 7th 1890 Mother went to town this morning and as it was rainy she did not come back. Willie Bremmer came last night and Pierce will come tonight. Will and I talked all the afternoon and I wrote a little in the evening. Monday September 8th 1890 It was a fine day and we washed and ironed both and put up some tomatoes. Brown came back today. We hear Grand Mother is no better. It was ten years today since John & Hatt were married. [the following text is written vertically in the right margin of the above entry] Lawrence quit work today and we got a new hand. Will fixed fence in the valley. 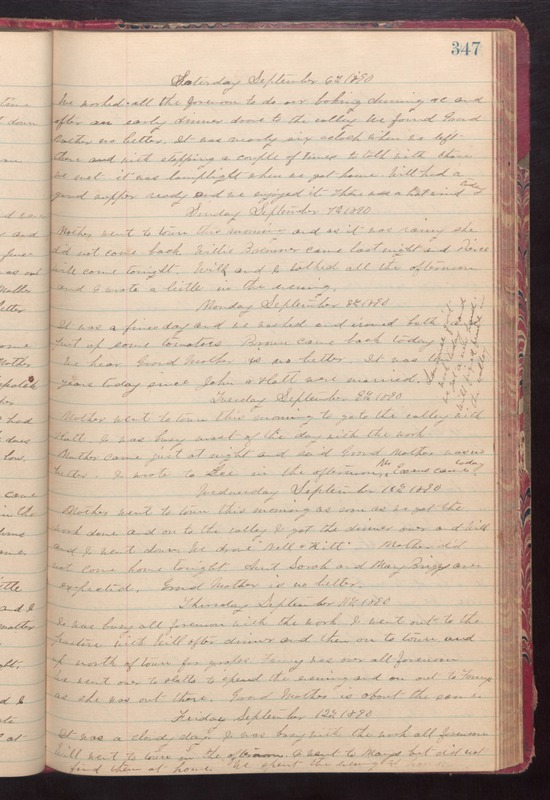 Tuesday September 9th 1890 Mother went to town this morning to go to the valley with Hatt. I was busy most of the day with the work Mother came just at night and said Grand Mother was no better. I wrote to Lee in the afternoon. Mr Evens came today. Wednesday September 10th 1890 Mother went to town this morning as soon as we got the work done and on to the valley. I got the dinner over and Will and I went down. We drove "Nell & Kitt" Mother did not come home tonight. Aunt Sarah and Mary Briggs [are?] expected. Gand Mother is no better. Thursday September 11th 1890 I was busy all forenoon with the work. I went out to the pasture with Will after dinner and then on to town and up north of town for grapes. Fanny was over all forenoon. We went over to Hatts to spend the evening and on out to Fannys as she was out there. Grand Mother is about the same. Friday September 12th 1890 It was a cloud day. I was busy with the work all forenoon. Will went to town in the afternoon. I went to Marys but did not find them at home. We spent the evening at home.